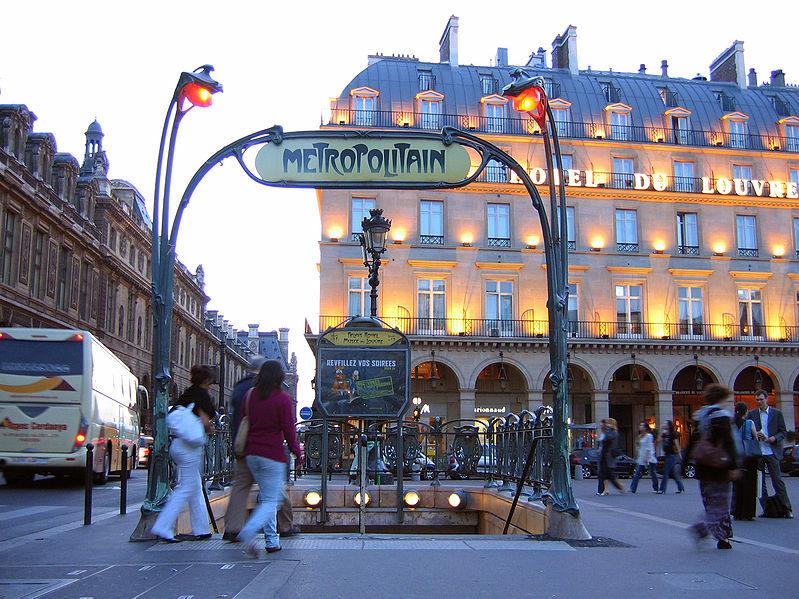 There’s something quintessentially Parisian about the Paris Métro. 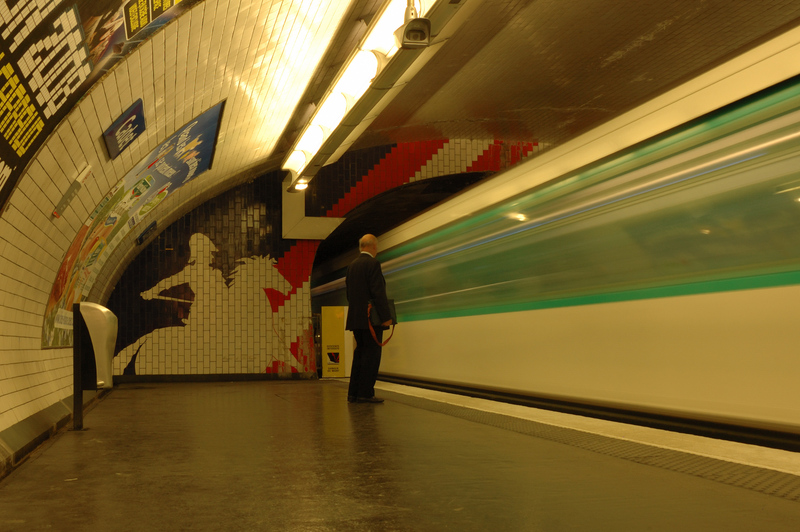 From the art nouveau entrances to the winding corridors to the white-tiled walls and ceilings, there’s simply no confusing the Paris Métro with any other underground transit system in the world. But did you know how American a few of the Métro stations are? For most French, these stations are probably no more interesting than, say, Boucicaut or Bréguet Sabin, but for an American, they’re little souvenirs of home right here in Paris. Métro station Franklin D. Roosevelt, located in the 8th arrondissement at the intersection of lines 1 and 9, was originally two different stations: Marbeuf and Rond-Point. The Marbeuf station was one of the first Métro stations to open—on July 19, 1900. It was named for rue Marbeuf, the street on which it was situated. The street itself was named for the Marquis de Marbeuf, who had developed the neighborhood during the 1770s and who, in recompense, was guillotined during the Reign of Terror. Distributing bread to the poor: good move; paving roads and building houses for the bourgeoisie: not so much. In 1923, when line 9 was extended from Trocadéro to Saint-Augustin, a new station named Rond-Point des Champs-Élysées was opened at the round-about intersection of avenue Victor-Emmanuel-III (named after the last King of Italy) and the Champs-Élysées. In 1942, the two stations were connected to form Marbeuf–Rond-Point des Champs-Élysées (or more simply, Champs-Élysées-Marbeuf). 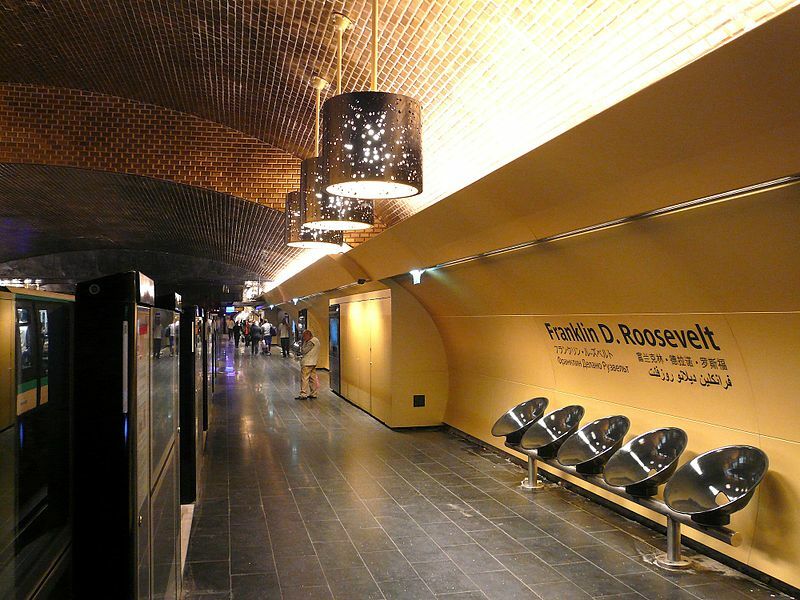 After the war, both avenue Victor-Emmanuel-III and the Métro station were renamed in honor of American President Franklin D. Roosevelt. Bringing the full force of the American military to bear on the Nazi occupiers of France: good move; being the King of Fascist Italy: not so much. If you hop on line 9 at Franklin D. Roosevelt and take it in the direction of Montreuil, you’ll soon arrive at Chaussée d’Antin-Lafayette, also in the 8th arrondissement. When the station originally opened in 1910, it was solely on line 7. The platforms for line 9 were added when that line was extended from Saint Augustin in 1923. 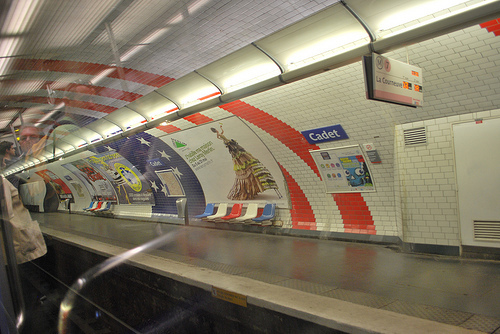 The station was originally named Chaussée d’Antin for the street bearing the same name. (A “chaussée” is simply the name for the part of a road that is paved to accommodate vehicle traffic. In the Middle Ages, such surfaces were paved with pebbles and chaux, or lime, hence the term “(voie) chaussée“—”limed lane.”) In 1989, “Lafayette” was added to the name of the Métro station to highlight its proximity to the shopping district along rue Lafayette. Of course, rue Lafayette was named for the celebrated Gilbert du Motier, marquis de Lafayette, known among Americans as perhaps the second-greatest hero of our revolution. That’s not why I’ve highlighted Chaussée d’Antin on my little “An American in the Métro” tour, though. One notable feature of the Chaussée d’Antin station is that the ceilings are beautifully painted above the tracks at both the line 7 and line 9 platforms. On the line 9 platforms, the painting features portraits of various famous historical and cultural figures. If you take a close look at the photograph to the right, you’ll notice the portrait—not of Lafayette—but of another famous hero from that era. It’s right there … just below Édith Piaf … Benjamin Franklin, American ambassador to the court of Louis XVI from 1776 to 1785. I wonder what Ol’ Ben would think about being under Édith Piaf … no, wait! On second thought, don’t answer that! After gazing up at Ben Franklin’s portrait on Chaussée d’Antin’s line 9 platform for a few minutes, switch lines and take line 7 north toward La Courneuve. (Just don’t go all the way to La Courneuve! Trust me on this.) Two stations later, you will arrive at Cadet. Like Chaussée d’Antin, Cadet opened in 1910 as part of line 7 from Opéra to Porte-de-la-Villette. It was named after rue Cadet, which was itself named after a Monsieur Cadet de Chambine, probably some petit noble, who owned a lot of the land through which the street passed at the end of the 18th century. What is remarkable about the Cadet station is that its walls are tiled in the image of an American flag, specifically the “Betsy-Ross” version of our first official thirteen-star flag, which was used between 1777 and 1795. At the end of the platform, there is also tile-work showing the silhouette of a cavalry officer in front of an American flag. Hmmm … that hat looks suspiciously French to me. No matter! That’s just Lafayette, right? I’ve yet to find any explanation whatsoever as to why the Cadet station is decorated like this. As far as I’m aware, there wasn’t anything particularly American happening in the world in 1910 when the station opened. Given the design aesthetic, I suspect the station was retiled at some point. The flag motif just doesn’t strike me as particularly “1910.” Perhaps it was redesigned after the First World War? Or after the Second? If you have any information about what prompted the use of this motif, please let me know! In the meantime, I’ll just take it as one more random piece of evidence of the deep and abiding love between France and America! Funny how both Roosevelt and Lafayette are also two of the most touristy metro stations in town. I have never noticed this flag in Cadet (but to my defense, I rarely took this part of line 7). Are you sure it’s not a recent addition? Now, I wonder why that is. I don’t think it’s THAT recent, but I do think it was retiled at some point in the past. I’m fairly confident that it’s not from 1910! Ha ha. I wish I had the backstory on why the flag motif was used. I think I need to pick up Lorànt Deutsch’s “Métronome” and see what he was able to dig up. If I do get around to that, I’ll be sure to update this post.